A much collected item, well items, are the graphic novels. They are available is several states and publication and in (I recently discovered) even in another language than English! In 1991 Eclipse Books, from Forestville, Ca., published the first two books of their rendition of Anne McCaffrey's Dragonflight. The adaptation was done by Brynne Stephens and the illustrations by Lela Dowling and Fred von Tobel. Mark Ferrari was responsible for the cover art. ISBN's were 1-56060-074-8 and 1-56060-075-6 and they were published in February and May respectively. These two books were followed by a conclusive third volume for which Cynthia Martin too Von Tobel's place. This third book is ISBN 1-56060-076-1 and was scheduled to be published in October of 1991 (the date also mentioned on the copyright page) but Hargreaves mentions it wasn't actually published until March 1992. I assume that sometime in 1992 or 1993 Eclipse Books came to be an imprint of HarperCollins for the UK market because it was that house who decided to do a popular omnibus edition of all three original volumes in one, (larger than) trade paperback, issue plus a real hardcover collectors edition in 1993. The ISBN for the omnibus is 0-586-21752-5; prices were for UK 7.99 pounds, AUS 17.95 dollars and NZ 19.95 dollars. For the cover of the omnibus was chosen for Mark FerrariÍs cover of the third volume in the original series (the one with the dragons flaming Thread). This was my first glimpse of the books. Pictures Cheryl sent me back in 1999. As said HarperCollins issued a special edition of the omnibus at the same time as the trade paperback edition. It's a hardcover edition bound in linen and presented in a slipcase, of which 500 were made and all of which are numbered and signed by Anne McCaffrey. There is an internet source (with a list of Eclipse publications) that claims a regular hardcover and a signed hardcover without the slipcase also exist but I have never seen these. The last state could easily exist just because the slipcase was lost of course. It is my experience this collector's edition is to be found on eBay once or twice a year. It seems to fetch prices from about US $ 70 and upwards. I recently discovered yet another publication of the graphic novel or comic book (whatÍs the difference? ): a Spanish language edition! ItÍs a reprint of the HarperCollins omnibus edition titled "Vuelo de dragon" published by Graphic Novels ediciones junior s.a., a company belonging to the grupo grijalbo - mondadori from Barcelona, Spain. Mondadori is Anne's Spanish publisher for regular books and itself part of Random House. There is no real clear date of publication to be found but since the "deposito legal" number is B-359-1994. From other sources I know this is indeed the case and the first edition of this book was published in January of 1994. The ISBN is 84-478-0116-0 and the translation was done by Maria Vidal Campos. It has 144 pages, including two advertisements for other graphic novels published by the same house (one by Clive Barker and one by Dean Koontz). The original price was 12,71 euro (US $ 16,20) but I paid half of that although I suppose they would fetch a higher price if presented on the "international market". Any which way, all these graphic novel editions are worth collection and worth reading. All of them are printed on deluxe, glossy paper and I must say that they all have a quality of paper, binding, cover and interior etc. that exceeds what is usually found for comic books by a long way. Great collector highlight, Hans! If you don't mind I'm posting a picture of one of the unsigned hardcovers and the cover of the paperback edition. I have one of the signed copies too, but it has no presentation case. Bought it before I knew too much about collecting. Very nice Highlight Hans, this was wonderful to read, I have had my first set since they frist came out, and my hubby bought me the signed one about six months ago now. You have done so much research to find all this great information about these editions...thank you. I love these book, as an artist I can appriciate all the hard work that went into making them. It is great to see the story come alive in all the drawings...these are great to get children to read or read to them, and start a whole new generation of Anne fans. Becky, you mean you have a numbered, limited edition withut the slipcase? If yes, my questions are: what is the number and is the text exactly the same as is shown in the photograph, but, more importantly, what is the color of the linen binding? I once bought one for Cheryl that is dark maroon but the one in the ebay ad is red, which is causing some confusion because I (mistakenly?) thought the limited 500 signed series was dark maroon. Knowing nothing about the specifics of the binding cloth used for these books, I will say that it's not unheard of for more than one color to be used on one printing of a book, as sometimes they run out of a particular color and switch to whatever else they have on hand. I think this is where it would be considered a different "state" of a printing but still the same printing of a particular edition. Becky, my signed limited edition didn't come in a slipcase either. Are we sure they were actually sold in one originally? The Hargreaves addendum wasn't even sure the edition existed (of course we know it does! ), but given the uncertainy there, perhaps there was no presentation case? My signed copy is just like you have pictured, Hans. But mine is number 185. It has the dark maroon binding cloth. So I'm not sure if there is supposed to be a case or not now. The signed card is exactly like you have pictured and pasted on the blank black page just before the pictures of the comic covers. Is it possible that they used the same card for both? I just thought I didn't get the slipcase based on the card. I've not seen the slipcased version. I can't find one on eBay at the moment either. Just the maroon signed ones with no case. Very interesting mystery! Oh, there is one maroon one that is not stating it has the signed card. I've emailed the seller asking if it has the signed card or if it looks like there once was a signed card in it. My copy also states on the limitation page that it was issued in a slipcase. So we have three known copies that seem to indicate being in a slipcase yet do not have them -- while I could see the ocassional copy losing its slipcase, it would be an amazing coincidence for the three of us to have all gotten copies where some collector hadn't bothered saving the slipcase of an obviously special item. Much more likely there really wasn't one to begin with. Searching with bookfinder.com, I found a few copies for sale. None mentioned having the slipcase, and one listing stated that the slipcases were never actually made. Oh, and Hans? You said that the 3-in-1 editions use the cover art from the third of the individual editions, but that isn't correct. Although the art looks very similar, it's not the same! Good eyes, Cheryl! Hmmm, since I don't have all the posters that match the graphic novels, is the poster of the third individual graphic novels like the cover of the 3-in-1? (I have the other two posters, just not the third one.) I started finding my posters individually and then they ended up being sold in sets of all three on eBay. Good question Becky -- does anyone here have the third poster? I just have the first two as well . Though I'm not sure I want the third, it's not as pretty. I've also wondered if the third cover and the 3-in-1 are perhaps different cuts of the same art, which the poster may answer if it happens to be a larger version with parts matching to both covers. I've not seen the third poster at all. Tho I swear that a few years ago someone was selling all three together. 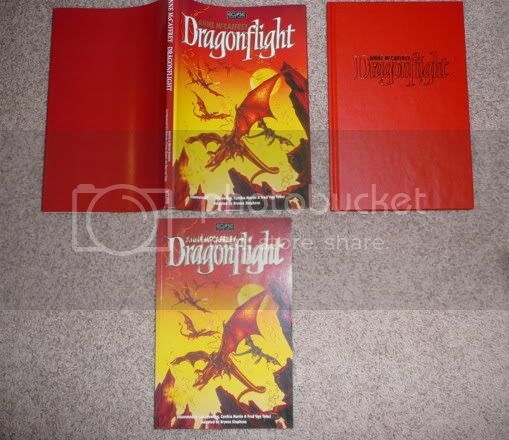 Hmmmm, anyone out there have the third Dragonflight poster??? The one that is the cover for the dustjacket and the paperback version???? A picture would be even better, please! WOW!!! I didn't even realize there were posters of the covers. I have the same copy as the one Becky showed in her picture, mine is # 320, and I don't have a slipcase for it either. Since I didn't know about any posters of the covers, I just copied them out of the front of the Hardcover copy. They make great pictures to hang on the wall. How much were the poster, when you bought them ??? I have a soft cover only edition. The Artwork continues onto the back of the book as a bigger version of the front cover. Also - courtesy of Anneli - I have volume 1 of the 3 part edition. But its put away safely and I can't get at it at the moment to check it out. I think the posters went for around $20-30 when I found mine. I had the Ramoth-Mnementh mating flight hanging over the guest bed for many years. Yep, I paid about $20 each for the two posters I have. They are LARGE posters too. Well if the posters are really that huge kind of poster size, then I am glad I went with the copying down the smaller versions from the books. I'm running out of wall space, with everything that I have hanging on them. Wow I didn't know that the 3-in-1 came in hardcover!! Posters would definitely be cool, but how do you put them up without damaging them? Too true, Sauchious! Too bad you didn't have a lower numbered copy for her. Or would you have kept it for yourself? Ah, the first person to have the slipcase! Lucky you! Now I (and probably a couple other people who I don't have to name) will be on the look out for a slipcased copy. Maelin, the posters do take up a lot of room on the walls. I had a vaulted ceiling in the computer room in my old house and one wall went up to the peak of the vault. So I hung them there. Jax, I used the largest poster frames they make to put them in. No pins! Just getting them in the frames was a two person job, with my hubby grumbling the entire time. Becky, WOW!!! I think yoiur house should be declared a national treasure of Anne collectables, you could make a quite few dollars charging admission to come in a look around. but you would have to have a treasure detector at the door, to make sure that none of them went wandering off at the end of the visit. Now I am glad that I just used the copies I made. I don't have any of that kind of room in my house, or that kind of money to use for posters instead of those lovely signed books I like to collect. Maelin, yep I'd love to get a peek at the slipcase! I'm sure a few other people would too! Maelin you're so funny! Not quite a National Treasure! There are lots of folks with better stuff, ie the lady who wanted a LOW numbered A Time When. Hmmmmm makes me wonder what number mine is.......not bad, 328. Wonder if anything under 400 is considered low? (400 being the mid point) And others with more rare author special edition type stuff. I'm just your normal collector when all's said and done. Well, at least we know for sure that it exists now, even if we can't see a picture! So silly wanting a low-numbered item -- I was reading somewhere once that just because a book has a low number doesn't mean it was produced earlier in a production run, as the books tend to get all mixed up after printing before numbering. So it's very random and the number doesn't have much meaning beyond when they pulled it off the pile. I know that with limited edition art prints that the artist signs a low number is desired, that or the highest number. Just because they were the first and last ones signed by the artist. To me they've all been signed so no big deal, but to some folks the lower the number the better and more valuable it is to them. Course thinking like that should mean that the most valuable ones would be 1 and 500 and the rest the same value. Amen, Maelin. I buy the books for me to KEEP, I don't plan on selling them. I've upgraded a few of my books, for ones in better condition. I haven't decided on whether to keep the 'old' ones or sell them. I kinda like having them. I buy books... I don't sell them! That' right C'ris, and too read them...over and over again!!! An unknown number of copies marked "AP" on the limitation card, for "author's proof" or "artist's proof". These were presumably review copies, and/or copies that the author/artists could present to friends. I just picked up one such copy, still in the original shrink wrap from the bindery. It was marked AP on the bindery label, and someone else had written on the label that it was signed by the artist -- but this was incorrect as it was only signed by Anne (yep, I broke the shrink wrap to check). Now I need to decide whether I'm keeping this copy or should resell it. I've recently visited Anne and was told I could avail me of anything at Dragonhold I needed for my research. Concerning the graphic novels I did ask Anne whether she remembered the maroon coloured edition, but she did not and I would have been very surprised if she had However, I found several of the regualr hardcover editions of the graphic novel with dustjacket and four of the dark red coloured limited editions. Of these last one was in Anne's office that had a relatively higher number on the little pasted sheet with Anne's autograph and the book's number and two others were in the attic. These last two were actually the numbers 1, 2 and 3 I took a handful of pictures of "number 1" for posterity and archival purposes. The number wasn't only inside but also on the sticker on the shrinkplastic wrapper. Opened box to show the gold foil stamped lettering on the "spine". Now we only need some pictures here of the maroon edition! Last edited by Hans; Aug 29 2006 at 02:59 AM. Beautiful Hans! I guess I'd call that a presentation box rather than a slipcase, as it certainly isn't a slipcase. I so wish I'd been able to tag along with you to Dragonhold. C) to have been able to chat with Anne about them! *gasp* I wasn't even aware that HC editions existed! I have a softcover 3-in-1 copy that I'm VERY proud to own, I just wish that they'd made more for DQ and TWD! That's a great wish, Spiff! Like Becky, I second that wish, Spiff. And you touched on one of the reasons we are doing the Collecting Highlights in the first place How many times, do you think, I said something along the lines of "I didn't know that existed"? Heck, it still happens! Though much less than yers ago! Funny story: when I recently asked Anne if she knew of the existence of that commemorative 30 years of Pern watch Cheryl bought and wrote about, she said to me she didn't even knew it existed!